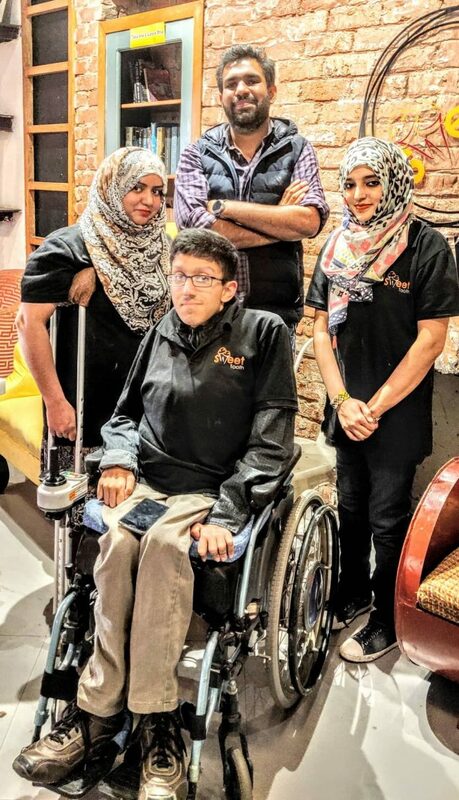 Umer Hussain, the Director at Sweet Tooth in Lahore, has recently shared a post on Facebook introducing his follwers to his differently-abled team at his cafe. Umer mentioned Waleed, a 24-year-old, suffering from muscular dystrophy, calling him an inspiring example and a beacon of hope and resilience. Moreover, talking about a little financial crunch he was going through, Umer shared that he received a message from Waleed suggesting that they should increase their revenue by selling breakfast and opening up early. He was overwhelmed to see his concern and dedication. Explaining further, Umer shared how Waleed and the rest of the staff are all treated equally. He wrote that he has never pitied him because of his condition. He has scolded him for coming late many a times and has even told him to be prompt at customer service. Syeda Kiran, is also a star employee who is out to fight against polio, and has outperformed everyone with her passion to learn. In his post Umer shared, When Kiran first joined, she lacked confidence and was shy, but today she has managed to overcome her fears. She can make deep dish pizzas, brownies, ice cream mixes, and has even started communicating with the customers. He further added that these people perform better than the regulars – their motivation is unparalleled. They have even recruited transgenders. He concluded his post by saying that sharing all this was neither a marketing stunt nor was it out of pity. His intention was to tell everyone that these people are fighting it out and showing everyone that they’re probably more skilled than many of us.